Here's the answers to some of the more frequently asked questions. If you have another question that isn't answered here, feel free to get in touch. If you have a general WordPress question, please head on over to the official WordPress Support Forums and post it there. I've just built a WordPress site for a client, can I give them a copy of your Easy WP Guide? Sure! That's exactly what it's here for. Go grab the latest copy. Do you mind if I remove your branding from the Word document version of the guide? Not at all. 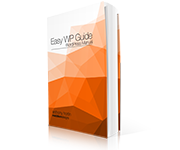 You can purchase an unbranded version of Easy WP Guide in Word document format so you can easily add your own branding to it before passing on to your own clients. The guide does mention that it is written by myself and it would be appreciated if you left that in. If you choose to remove it though, just don't claim that you've written the content yourself. The content is still copyrighted to myself, since I wrote it, I'm simply providing you a license to use it. I've customised the WordPress Dashboard for my client, can I update your guide before giving it to them? Absolutely. You can use the guide as is, or if need be, add further content to it if you find there’s an area not covered sufficiently for your circumstance. You’re also free to remove sections if it doesn’t apply to your situation, such as if you hide certain Dashboard features for your clients ease. I'm running some WordPress training at work (or school), can I give my students a copy of your guide? You're free to provide the PDF version of the Easy WP Guide to your staff or students when running a training session. If you plan on providing a version with your own branding though, please follow the Fair Use Policy outlined in the FAQ's below and purchase a separate $13 license for each block of 20 clients. If you're a website hosting company or a dedicated training organisation, please get in touch to discuss generous custom licensing options. Can I rebrand your guide and provide a copy to my clients? Yep! That's exactly what the unbranded (Word Doc) version of the guide is for. 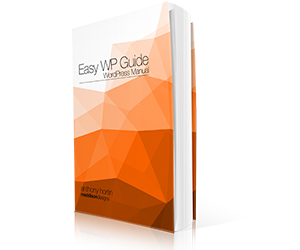 You can purchase an unbranded version of Easy WP Guide in Word document format so you can easily add your own branding to it before passing on to your own clients. The guide does mention that it is written by myself and it would be appreciated if you left that in. If you choose to remove it though, just don't claim that you've written the content yourself. The content is still copyrighted to myself, since I wrote it, I'm simply providing you a license to use it. The brandable WordPress manual is designed for WordPress consultants to give to clients as a form of training under a license intended for use by freelancers and small studios. If you plan on providing a version with your own branding, please follow the Fair Use Policy outlined in the FAQ's below and purchase a separate license/guide for each block of 20 clients. If you're a website hosting company or a dedicated training organisation, please get in touch to discuss generous custom licensing options. Can I upload the guide to my website so my clients can download it? 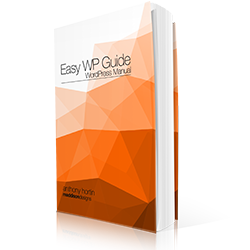 If you purchase the unbranded version of Easy WP Guide with the aim to add your own branding, you're free to upload a PDF version of your branded guide to your website. I simply ask that you don't make the Word Doc version available for download. That's like providing someone with the source code to your website. 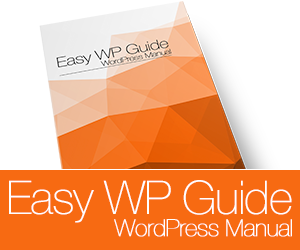 If you're not interested in branding the guide but still want to provide a link for your clients, simply add a link to the Easy WP Guide website so your clients are able to find the very latest version. I want to publish a WordPress book or eBook. Do you mind if I include your content? I do mind actually. I'm sure you can agree it wouldn't be fair for you to profit from all my hard work. Can I sell a copy of your guide on my site after I've rebranded it? Nope! 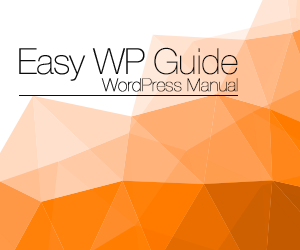 By purchasing an unbranded version of the guide, you're simply purchasing a license to use my content. You don't own the content. The content itself still belongs to me and is copyrighted to myself. It wouldn't be fair for you to profit from all my hard work, now would it. I've got a WordPress site or blog, can I use some of your images? You can provide this guide to your clients, including tweaking it for your own use if you purchase a copy of the unbranded version, but sorry, you can't simply use part of my content (incl. images) for your own website. WordPress version x.x came out today, why isn't your guide updated? In order to make sure the guide content (including all those lovely screenshots) always match the very latest version of WordPress, I don't start updating it until the very last moment. Prior to releasing a new version of WordPress, the core developers will release a few Beta* versions followed by Release Candidate* versions. Although these versions are very close to the finished product, features have been known to be removed, added or updated even with these late versions. So that I'm working with the very latest copy of WordPress, I wont start updating the guide content until after the first Release Candidate has been released. On top of that, depending on what has actually changed in the new version, updating the guide content can take anywhere from a few days to a couple of weeks. This, unfortunately, means that any new version of the Easy WP Guide wont actually get published until a week or so after each new version of WordPress is officially released. No need to worry though, if you've signed up to our newsletter, follow Easy WP Guide on twitter or like us on Facebook, we'll let you know as soon as its been updated and ready to download! * Beta and Release Candidate versions are part of any normal software release cycle. How is your guide licensed? 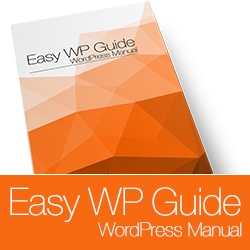 The Easy WP Guide is licensed under a Fair Use Policy. In short, this license lets you remix, tweak, and build upon my work provided you purchase the unbranded version of the guide. You can provide this guide to your clients but you cannot make the guide available for sale on your website or anywhere else. The brandable WordPress manual is designed for WordPress consultants to give to clients as a form of training under a license intended for use by freelancers and small studios. If you wish to distribute this guide to more than 20 clients, please consider the work involved in creating and updating this guide and purchase a separate $13 license for each block of 20 clients. That works out to 0.65 cents per copy! How cheap is that!! If you’re a hosting company or training organisation looking for commercial licensing please get in touch to discuss custom options. For more information on the usage, please check out the other Frequently Asked Questions on this page. Do you have any badges I can use to promote your guide? Sure do! I appreciate you sharing my guide. Thanks. You can use the following badges. Just right-click and save the images. I have a problem with my site, can you help? If you’re having a problem with your WordPress site or just need some help, please submit your question to the official WordPress Support Forums. As much as I’d love to, I can’t provide general WordPress support for everybody. The WordPress support forums however, have been setup just for this purpose. If you're looking to hire someone for some custom WordPress development, you can get in touch with me through my business, Maddison Designs. I've had a couple of people mention that they haven't been able to get to the checkout page and/or they've received an SSL error. Some people have received a message along the lines of “An SSL error has occurred and a secure connection to the server cannot be made” or “Safari can't establish a secure connection to the server”. After some investigation, it appears that this is occurring on older versions of Mac OSX and Safari and is related to the Apple “Goto Fail” bug. I would highly recommend that you update your version of OSX and Safari. Alternatively, try using a more modern browser such as Chrome or Firefox. Why do I have to purchase the brandable version now? This used to be free! If I've paid for the guide do I automatically get free updates for each version? Unfortunately not. When each new version is released, if you want to distribute the updated guide to those same clients (or new ones), you'll need to purchase the guide again (if you plan on rebranding it). 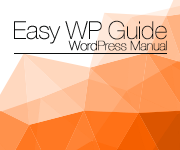 As I'm sure you can appreciate, there's an enormous amount of work that goes into each and every version of the Easy WP Guide so I can't just provide continuous free updates. For 20 clients, the $13 fee only amounts to 0.65 cents per client. If the guide is helping build your business, I hope you believe the small fee to be worth it. Can I copy your content from the site (or downloaded Guide) to my own website? I'm sorry, but I'm afraid I can't give anyone permission to include my website content on their own site. The same goes for the downloaded PDF or Word Doc versions. If someone purchases the unbranded version and then rebrands it, I'm happy for them to upload a PDF version of the rebranded guide on their site, but you can't simply transfer the content to your WordPress site. I do have a version of the guide that people can read online though. What's this Fair Use Policy thingy? The brandable WordPress manual is designed for WordPress consultants to give to clients as a form of training under a license intended for use by freelancers and small studios. If you wish to distribute this guide to more than 20 clients, please consider the work involved in creating and updating this guide and purchase a separate $13 license/guide for each block of 20 clients. Do you have older versions of the guide that i can download? Sure do. 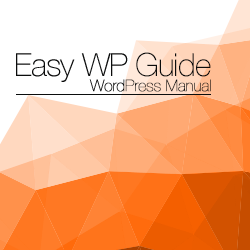 Head over to the Shop page and you can view all the current and previous versions of the guide that are available.